BentoLunch.net - What's for lunch at our house: Welcome Back! And a Lunch! Welcome Back! And a Lunch! After writing this blog for over 10 years, I decided I needed a mental break and took a semester off. I still made some lunches here and there and took pictures, but decided it was time to sit back and not think about it for a few months. We had concert and jazz rehearsals and Scouts x2 and soccer practice and ski season and the first semester of dual enrollment community college classes for the girl. So if you are reading this, thank you. I appreciate my readers so much and the break has me ready to start blogging again. I have no idea when this lunch was from. It bears the appearance of us forgetting we needed a lunch for something. It's simple and the picks help up the cuteness a little bit because the girl's school friends are intrigued by the little forks (and they're all high school guys, which cracks me up). We've go ham and turkey and havarti on honey wheat bread, cut on a diagonal and skewered with animal picks. 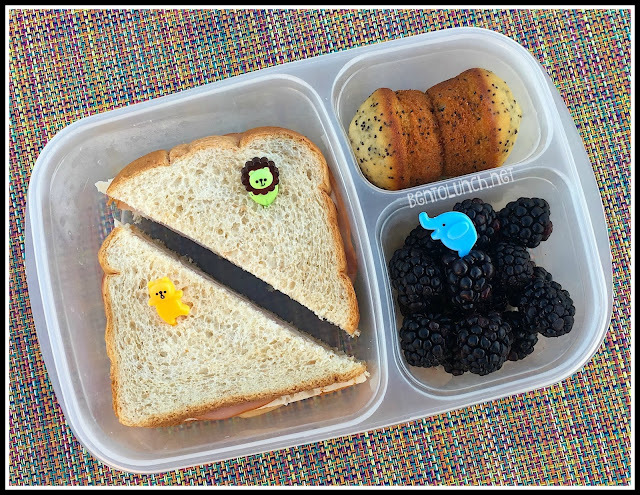 There's two almond poppy seed muffins and blackberries with another animal picked, all packed in one of our EasyLunchboxes. Simple, effective, and depending on which kid took it, there was a bunch of extra snacks in the bag!